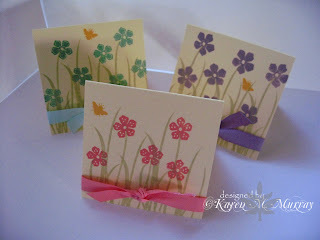 I thought I could live without the Honey Bees set from Papertrey. What was I thinking??? I finally broke down and bought it and I have to say I have not had this much fun playing with a new stamp set in a long time. I have been wanting to try my hand at some 3x3 cards for a while now and thought I would just go ahead and give it a whirl while I was playing. I just stamped my images on Papertrey Lemon Tart paper with Papertrey inks and tied a ribbon around the bottom. So cute! I really like the pink, it's my favorite. Of course, I love pink! I realize my Aqua Mist ink is off. I will be reordering it as soon as Papertrey gets it back in stock with the kinks worked out of it. I still think it's pretty though.